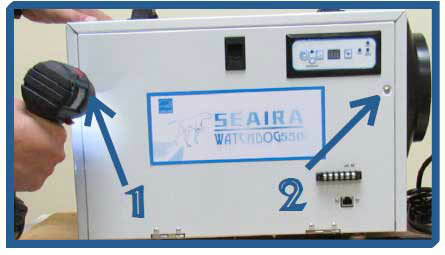 At 55 pints per day, the WatchDog 550 is the smallest crawl space dehumidifier offered by Seaira Global. 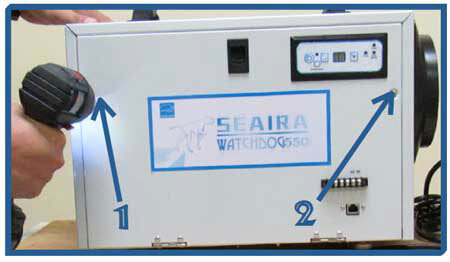 When you need a dehumidifier for a compact area, the Watchdog 550 is the ideal solution. Only 12” tall and 40 pounds, the 550 is easily maneuverable in practically any space. While it may be the smallest dehumidifier in our lineup, the Energy Star Rated Watchdog 550 is still powerful enough for areas up to 10,000 cubic feet. 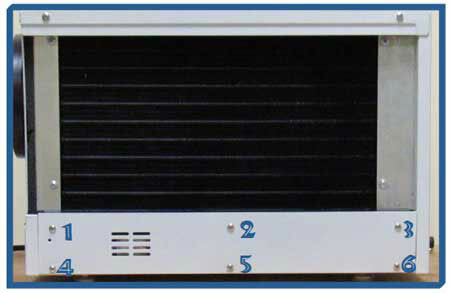 The unit produces a 250CFM airflow at an efficient 2.44 L/kWh. 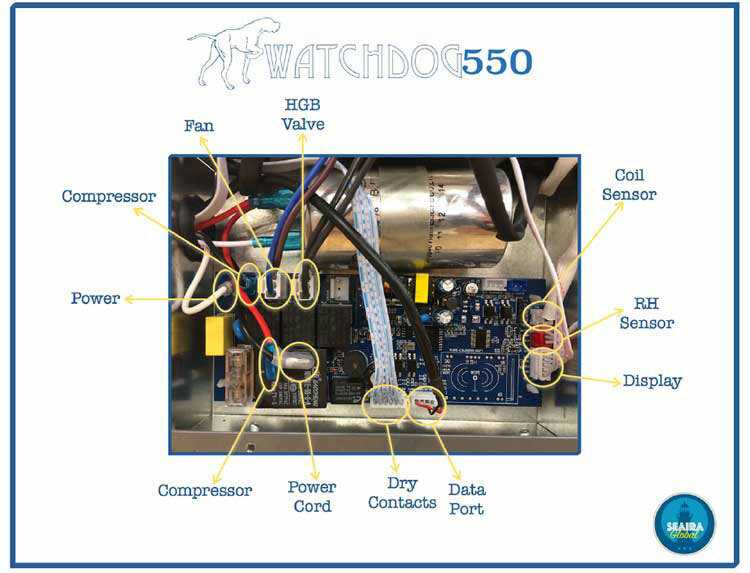 The Watchdog 550 also includes several convenient upgrades that make using the machine quite simple. For instance, when you need to set your desired humidity level, simply use the digital touchpad display. Once the set point is in place, the 550 requires very little input from you thanks to features like automatic humidistat control, hot gas bypass, and auto restart. Dimensions 18" x 12" x 12"
1. 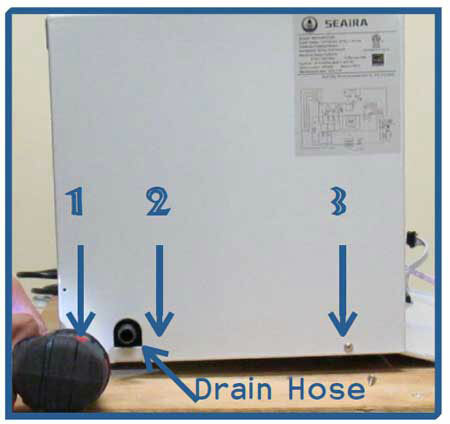 First, carefully slide the filter out of the back of the dehumidifier. Set the filter aside. 2. Use the screwdriver or drill, to remove the two screws holding the cabinet door in place (one screw on each side of the door). 3. Next, use your hand to open the safety latch in the center of the door, and lower the cabinet door. 4. At this point, you can begin removing the screws on the cabinet. 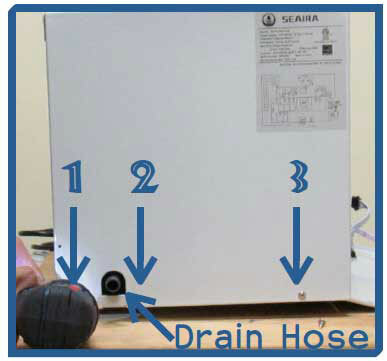 Start by removing the 3 screws on the drain hose side of the cabinet. 5. After that, remove the 2 screws on the duct adapter side of the cabinet. 6. Finally, gently lift the cover off the dehumidifier. 1. First, gently place the cover back on the dehumidifier. 2. Next, you will need to secure both sides of the cabinet. 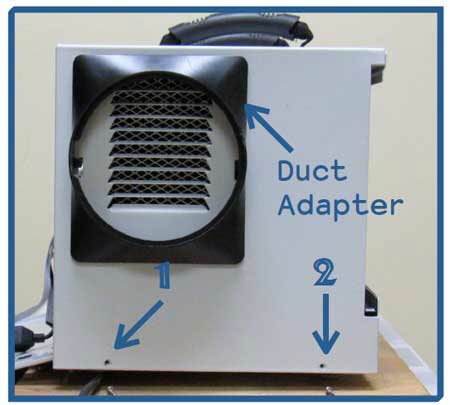 Start by replacing the 2 screws on the duct adapter side of the dehumidifier. 3. Next, replace the 3 screws on the drain hose side of the dehumidifier. 4. At this point, you can close the cabinet door and secure the safety latch. 5. 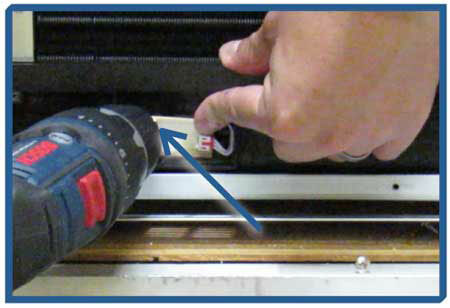 Next, use the screwdriver or drill to replace the two screws holding the cabinet door in place. 6. Finally, slide the filter back in place. 1. First, you will need to open the access door on the side of the dehumidifier. To do this, use the screwdriver or drill, to remove the two screws holding the cabinet door in place (one screw on each side of the door). 2. Next, use your hand to open the safety latch in the center of the door, and lower the cabinet door. 3. At this point you can unplug the display board from the display cable. 4. Now you can finish removing the display board by unscrewing the 4 screws, then lifting off of the cabinet. 5. Set the old control board aside and grab the replacement control board. Position the control board on the cabinet, then screw into place (remember there are 4 screws, one in each corner). 6. Plug the display cable into the new display board. 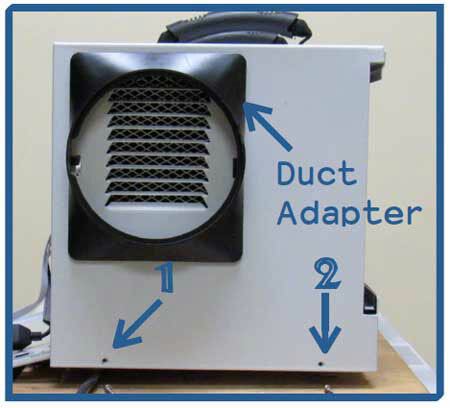 Prior to closing up the cabinet, plug the dehumidifier into a wall outlet, and power it on, to ensure the new display board is running properly. 7. Finally, close the cabinet door and screw into place. 1. First, slide out the filter from the back of the machine so you have access to the drain. Set the filter aside. 2. Next, mix together one of the cleaning solutions listed above (choose either Option #1 or Option #2, you don’t need both). If you’ve moved the dehumidifier out of the crawl space, be sure to set up the machine, so the drain tube has somewhere to drain, such as a bucket. 3. Once your cleaning solution is prepared, slowly pour it into the drain tray, moving from side to side until it is gone. 4. At this point, let the solution sit for 10-15 minutes. Then, slowly pour the plain water into the drain tray (in the same manner that your added the cleaning solution). This will flush out the cleaning solution. 5. Repeat this process at least once a year. 1. First, slide out the ﬁlter from the back of the machine to reveal the coils. Set the ﬁlter aside. 2. Next, evenly spray the coils with the coil cleaner. 3. That’s all you have to do. There’s no need to rinse the coils because when you start using the unit again, the dehumidiﬁcation process will do that for you. 4. Repeat this process once a year. 1. 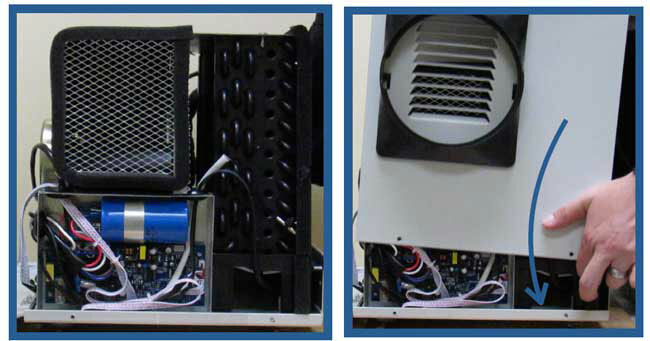 First, you will need to remove sensor cover on the back of the dehumidifier. There will be 6 screws. (The filter can be removed or left in while changing the sensor). 2. Remove the sensor cover and set it aside. 3. 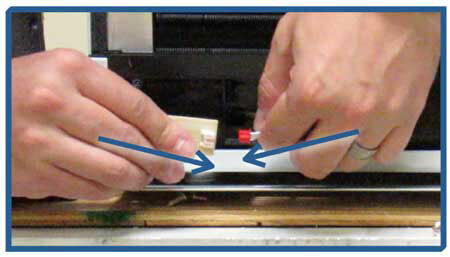 Next, use the screwdriver or drill to remove the screw holding the sensor in place. 4. At this point, use your hands to unplug the sensor from the sensor wire. Set the old sensor aside. 5. Now you can grab the replacement sensor and plug it into the sensor wire. 6. Once plugged in, use your hands to reinsert sensor into its position. 7. Hold the sensor cover in place as you replace the screw to hold it in place. 8. Finally, set the sensor cover in position and screw into place (remember there are 6 screws). 1. First, you will need to remove the cabinet so you can access the control board. 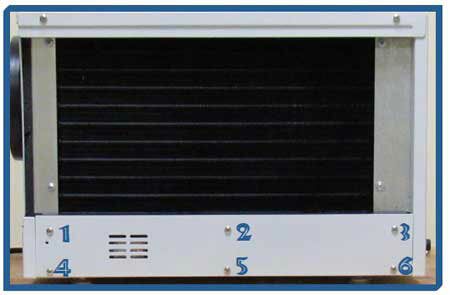 The control board will be located on the duct side of the machine. 3. 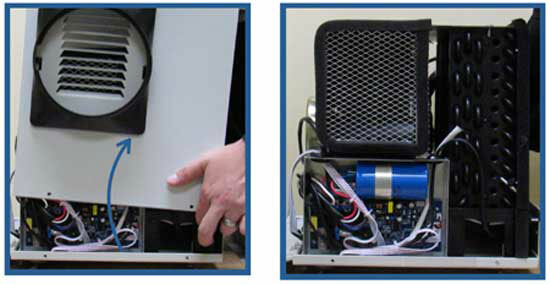 Once the wires are unplugged, you can lift the the control board out of the machine. To do this, you will need to the needle nose pliers. Use the pliers to push in the 4 “arrowhead” tabs (one in each corner). 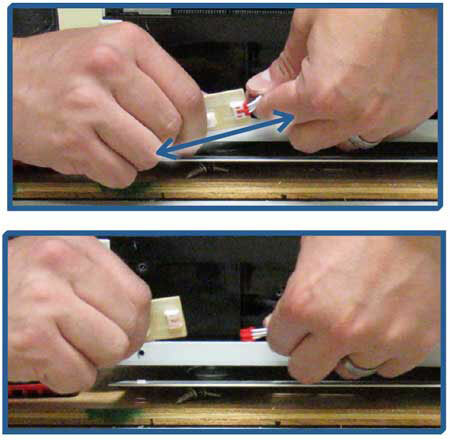 Simply squeeze each tab with the pliers so the control board can be lifted over the tab. 6. Once all the wires are plugged in, all thats left is to place the cabinet back on the dehumidifier.